I had originally intended on reviewing Jon Leon’s excellent and groundbreaking new chapbook TRACT. BlazeVox’s bandwidth restrictions, however, decided otherwise. Apparently, excessive traffic has brought the downloading of Jon’s masterpiece to a halt. Expect a full post dedicated to TRACT when the situation has been remedied. Mark Young has always been a poet of the thing rather than the medium. That is not meant with any disrespect. On the contrary, his dedication to articulating the most basic realities of our existence is a welcome change from the language consciousness with has held alternative poetry by the throat for so long. While Mark’s writing is always tuneful and agreeable, it is clear that his primary interest lies far beyond the mere vessel that is writing. That being so, it may seem unusual that he chose to build a collection of poems around the work of René Magritte, the late great Belgian surrealist who once claimed that his images "do not mean anything." A disciple of the fantastic, Magritte crafted dreamy situations often hinged upon alien juxtapositions. He laid a veil of "mystery" (his own word) over every creation. This hardly seems to be fertile ground for a realist whose mastery of form has never diminished his emphasis on function. Right? Yet meaning is precisely what Young culls from these marvelous images, most of which he has so thoughtfully granted a companion poem. And though more than a few are fit to have leaked from the pen of Lamantia ("birds/ are made from/ the air/ The house/ we live in/ is a/ forest"), the majority are distinct products of the poet who managed to find the "real" in "surreal." Few remain within the hallucinatory constructs originally established by Magritte. Take for example, "Intermission." The painting: pale fragments of human bodies congregate next to a curtain; behind looms a spotted mountain surrounded by a brood of dark clouds. The poem: a left-ish contemplation on the "War on Terror" written in hay(na)ku form: "Let’s/ hope/ then that/ the actions of/ those/ who invaded/ Iraq or blew/ up Atocha Station/ were parts of/ the final act/ of a tragedy/ &/ not part/ of the intermission." Another, "Golconda." The painting: sedate gentlemen fall from the sky at dusk (dawn?). The poem: a humorous little gem about love, life, and dating Mr./Ms. Average, it includes mention of the song "It’s Raining Men" and finishes: "if you ask enough people/ sooner or later some/body’s/ bound to come across/ even if it is only/ an anonymous Mr Average/ in a mass-produced bowler hat." Ain’t that the truth? At one point Mark reflects on the style that is so typical of René and his comrade surrealists but so radically different from his own: "It is the image that is/ so/ first paint/ the painting/ & then decide/ what the/ locomotive emerging/ from the fireplace/ might mean." It is strange but perhaps not unpredictable (opposites attract, etc.) that the two styles (one top-down and the other bottom-up) mesh so nicely in Series. The weakest poems of the bunch are those which merely turn painting to verse. They are often delectable ("I eat myself/ in exquisite agony"), but lack Mark’s fine sense of exposition. In other words, they leave you wanting something more; they are appetizers, not entrees. He manages to bridge the gap with “The Threshold of the Forest”, in which he ponders sullenly: "In the march/ of civilization/ there may come a time/ when the/ artificial forest/ is indistinguishable/ from the/ natural city." This sort of bristling cultural-analysis-in-ten-lines-or-less is wonderfully typical of Mark. Series Magritte was released some time ago, and has existed in blog form for years. You have probably read earlier versions of many of these poems in any number of online or print venues. Nonetheless, it is a solid read that warrants far more applause than it has thus far received. Perfect bound with a glossy cover and back, it is available from moria via Lulu. If you’re down with the Belgian-Aussie connection, go grab a copy. You will neither regret it nor forget it anytime soon. PERSISTENCIA gets an electronic make-over. I have long appreciated nick-e melville’s playful deviations. In my own publications and in others, I have kept an eye out for his name and his signature wit. So I was happy when I recently received a copy of his new chapbook Office Gnomics (from the elusive Acton Press). The collection is born from an employee’s manual that had the unfortunate luck of becoming melville’s plaything. In tone, it is reminiscent of the radical arts movements of the 60’s and 70’s; in form, it is the direct descendent of Ron Johnson and Mike Koshkin. But this is no RADI OS. It is far more subversive, far more piercing, far more critical. And a much quicker read, at that. Melville confronts the downside of corporate “wage slavery” (term du jour amongst progressives these days) and explores the fundamentally repressive and exploitive nature of 8 to 5 office life. He cracks bitterly “dare/ taking no breaks” and ribs management here and there. Accompanying melville’s sharp words are found images from the pages of the employee’s manual. Most of them are altered, faces erased and hand positions manipulated. On whole, the simple visuals enhance the project. Stark and ghostly, they contrast nicely with the sometimes tangled verse. By the end, however, they are more than a little repetitious. 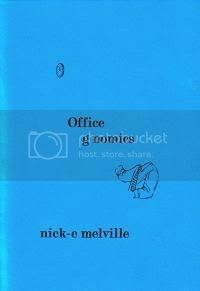 Office Gnomics provides no means for contacting Acton Press, but melville’s e-mail address is scattered across the Internet. This down-n-dirty chap is certainly worth some quick Googling. Get to it. Note: This is the first of an ongoing review series which will appear irregularly at this address. If you are interested in contributing material to be featured, write to phil.primeau@gmail.com. Chapbooks, broadsides, and 'zines only, please. Download and read it for free here. `Chapbooks by G Emil Reutter, Kirby Olson, and Lewis LaCook. What: A chapbook contest run by Phil Primeau and financed by PERSISTENCIA*PRESS. Manuscripts should be no longer than thirty pages, flexibility is a plus. Poetry or short fiction only. When: Manuscripts may be submitted at any point between July 8, 2006 and August 8, 2006. Winner will be announced by September 1.
Who: All are welcome to enter; special consideration will be given to up-and-coming voices. Why: Winner receives $150 prize, 150 chapbooks (with unlimited POD for three months). One honorable mention will be compensated for entry fee. Include SASE, no electronic submissions. $10 entry fee. What: A chapbook contest run by Phil Primeau and financed by PERSISTENCIA*PRESS. Manuscripts should be no longer than thirty pages, flexibility is a plus. Poetry or short fiction only. When: Manuscripts may be submitted at any point between July 8, 2006 and August 8, 2006. Winner will be announced by September 1. Bolts of Silk, another addition to the blog-zine scene. New poems posted several times a week. Check it out.